Once upon a time I’ve been a huge Alexei Yagudin fan, so I just couldn’t pass by this interview. Hope you’ll also enjoy translation. I went behind the scene with a smile, but then to the ambulance. The period when I was finishing career, was very painful for me, in all meanings of this word. Few people know, but problems with hip plagued me since childhood. When I was a kid, I could go to the trainings, and then my leg doesn’t work, and I’m lying in the snow. Then I got up and walked on. Since I was five or six years old, the pain has gradually increased. Especially painful episode happened a week before Olympic Games. We even had a conflict with Tatiana Tarasova, my coach, almost to return of tickets. Still this did not happen. After the Olympics, I continued my career, won five more tournaments, but at some point it became impossible to skate. I was constantly on the pills, and three times I was taken out from the ice. I went behind the scene with a smile, but then on stretcher into the ambulance. The doctor said that I have to endure till the end and to change a hip joint. I’ve suffered for a long time, but idea that I can return to the sport didn’t leave me. I’m a man-adrenaline and couldn’t understand how can I lose it all. Despite an Olympic medal I didn’t self actualise myself fully. I wanted a further development, competitions. For a year I’ve watched skaters, tracked new trends, consulted with coach, choreographer, we wanted to return to the sport after surgery. We had a plan, found music. But the painful symptoms have persisted for another two years. So, I had to let go the thought of coming back. We removed seats, put mats on the floor and lay huddled in sleeping bags – and traveled in Siberia where was -30C. When I finished a career, I had no idea what will happen next. I knew that there was a world of professional sport: tours and so on. But memories of the sport were too bright and vibrant, for a year and a half, I’ve really missed it. I knew that it’s the end, but didn’t know what to do next. I could be a coach, but I think that it’s the easiest way the athlete can choose. This is a very difficult profession, but at the same time, this is the easiest step forward. I’ve never wanted to do it and probably will never want. Fortunately, thanks to Ilia Averbukh in Russia began to develop a business project called figure skating. I know that Ilia told about huge losses after the first tour. Probably, he also told how we traveled in buses. We removed seats, put mats on the floor and lay huddled in sleeping bags – and traveled in Siberia where was -30C. Now we can proudly say that we have a great product. Soon, by the way, starts the new season of “Ice Age”. And I’m glad that today we have the whole Ice Palace “Iceberg”. It is one thing to held the Olympics, and quite another to use Olympic objects, to find someone who will work there. This year over the summer we will give 80-85 performances. Thanks to the development of domestic tourism the number of our viewers has exceeded 100 thousand. About two thousand people come every day. It is great! We are at the south, there are sun and sea. And people come on the ice! When the doors of sport are closed, any athlete faces a question: what’s next? How to live? What will I do now? It’s not a secret that many athletes had a reckless attitude toward studying. But in the end it turns out that they can do nothing besides skating or throwing spear. Here you can draw a parallel with what is happening in the sport. Those skills that an athlete receives in sport certainly can help him in the future. I always put on the first place the internal human desire to move, to grow, to learn something new, to raise their level of professionalism constantly. Also a great importance has the team that surrounds you. If in 2002, when Ilia Averbukh and I were winning Olympic medals, I had been told that in 10 years this man will create new TV projects and offer me a job, I probably would have laughed. But Ilia found within himself something that constantly pushes him forward. And he’s was the first to create such a product that did not previously exist. Winning is possible only thanks to people, who don’t just tell you what to do, but also listen to you, or at least pretend to listen (laughs). Here is an example. When I was skating there were two big teams. 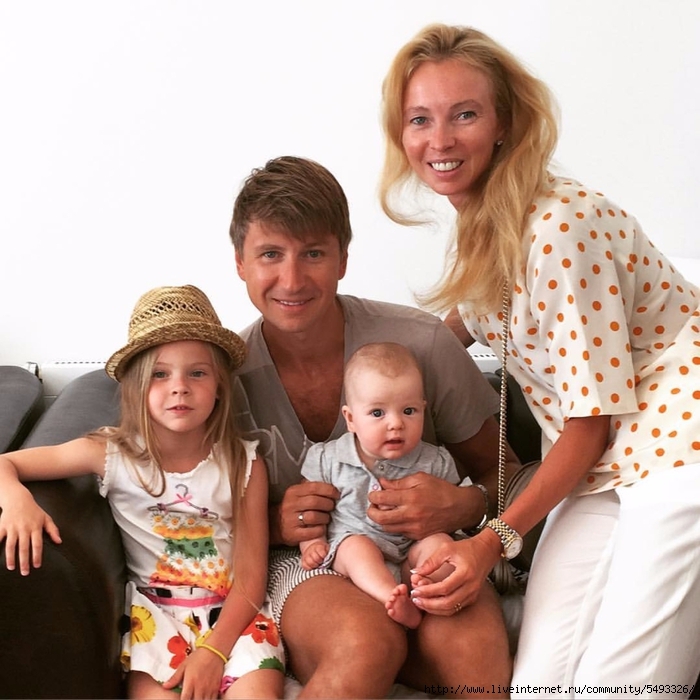 I, Evgeni Plushenko and Alexei Mishin trained in St. Petersburg, we had professionals of costumes, music, etc. And there was another, exactly the same team, but with Tatiana Tarasova in the led. We were a bit unlucky with the Federation of figure skating in Russia. Once its president came to me and said in the face: ‘Believe me, if you move to Tatiana Tarasova, you won’t win a single tournament’. I decided take a risk and left. What is most interesting, I really didn’t win a single tournament with the voice of Russian judges. I always looked at the draw of judges and hoped that ours won’t be there. As soon as they appeared, I immediately started to have problems. But there are moments when you need to change everything and rush to reach your goal. Such as moving to Tatiana Anatolievna. Or half a year before the Olympics. Then I realized, what any girl, who wants to look beautiful passes through. We ate so: a cup of coffee, two apples and porridge on the water. In the morning you stand on the scales, you think: ‘Great! Minus 200 grams per night. ‘ Then went to the shower – plus 150 grams. How? But this leads to a result, when you know in sake of what you’re doing this. And I knew, because I had a little more than six months before the Olympics. Psychology is an important thing in sport. Sometimes competitions are won by people who better prepared psychologically than physically. For example, after the Goodwill Games, where I was third, I wanted to finish everything. Tatiana Anatolievna realized it. She knew how to take me (smiles). We drank a bottle of wine, then a second, looked at the sunset. And Tatiana Anatolievna said: ‘Let’s wait. There are six months till the Olympics, you will be in the top three in any case. Well, will lose to Zhenya, to somebody else, but an Olympic medal will be useful for you. ‘ And I decided to stay. Alexei Mishin was also a good psychologist. At figure skating competitions there is always a gap on the board, where sits camera operator. 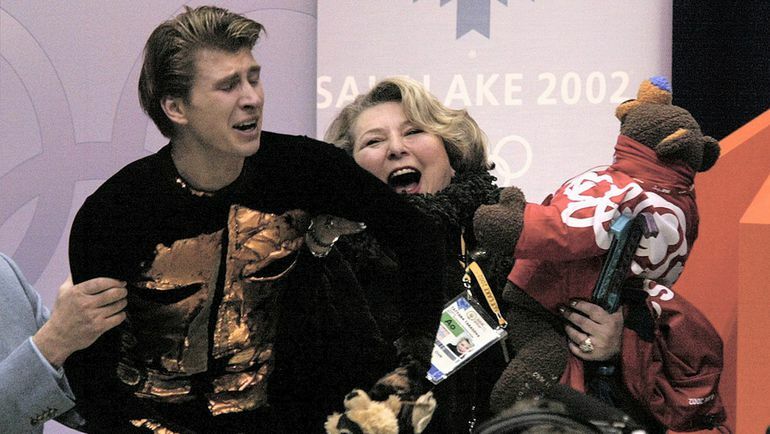 Athletes are not allowed to stand there, but Alexei Nikolaevich with Plushenko during the Olympics somehow made their way there. I go out and see that at the one side I have the Olympic rings, on the other – they’re warming up. This was a psychological attack. We had a a psychologist in the team. He always tried to clean my head. He told that the right hemisphere is very bad, so come to my room. I came, he counted something and I had to sleep. Of course, I showed that I fell asleep, snoring slightly, twitching in sleep. He drove his hands, then wake me up and say, ‘That’s all, you are fresh!’ Of course, it’s funny but he did the most important work. The main thing is to distract the athlete. As a child, you want to distract, so he don’t do anything stupid. When it’s 15 minutes before the start and you go to the toiled for the hundredth time, walk aimlessly back and forth, going crazy. And psychologist just went everywhere with me, talked about girls, distracted me well. And he told me my favorite phrase before the Olympics “Who, if not you, and when, if not now” – I found a deep meaning in this phrase. When athletes finish a career, they face serious psychological problems. Why to dissemble, many athletes drink too much simply because they don’t understand what they do next. Of course, the lack of effect of adrenaline also affects. I know a lot of athletes who have finished sadly. It’s great when you have an Olympic medal. But there are a huge number of people who have gone into the sport and have achieved nothing, but didn’t pay attention to education. I was lucky: my mother forced me to study, and I finished school with a silver medal – so there is something in my head. My mother was a research officer, so I liked all the exact sciences. Checking homework, mom, did the right thing: without telling me where is a mistake, she forced me to find it. And up to two or three o’clock in the night I was looking for this mistake. Thanks to her efforts, I can correctly place the punctuation and do not use the T9 function. And can say two words. I hope I can (laughs). In our country, athletes aim everything only on sport. But in America the sport it’s a kind of hobby. There are, of course, a small percentage of those who throw everything and stupidly plunge into the sport completely, but most athletes continue to study. And that’s why they don’t have such a gap. In our country if the child is doing sports, parents often forget that it’s not medal that makes a men from children, but education. The most important thing is to be intelligent, educated people, who will be able to find a solution in a difficult situation, not an athlete who can’t do anything. This is my opinion and I can be wrong. But in general, an ideal system doesn’t exist. When I trained with Alexei Mishin, we did full run-throughs only at competitions, we always skated layouts. It was the Russian system of training, according to the principle of “lets see how it’ll go”. And in America, athletes skated full programs. When they came to competitions, they were ready for anything, and Russian, as always – everything at the last minute and by chance. But somehow we were winning. And the Americans were winning. So the ideal does not exist. I have a friend Victoria Dayneko, with whom I skated in the “Ice Age”. She once asked me to star in her music video. I said, ‘Why just to star? Let’s sing!’ Then I realized that I absolutely have no voice. Whispered something, computers did everything, but still … Sometimes on tour somewhere in the Far East to raise all other athletes’ mood, I turn on this song – everyone starts to laugh and forget that how hard it’s and how much they want to sleep. All new is scary. I remember my first lecture, when I realized that I was saying the same thing on the second, third time. I remember the first experience in television. They inserted a separate microphone into your ear, and someone starts to talk directly with your brain. You’re all wet, your hands are cold from fear. I didn’t learn to be a host, do lectures, sing. But I had to go on stage and do it all. You know, it happens that you’re driving in the car, not in the mood. Turn on the radio, and there your favorite music tracks. You internally begin to sing it, and there is a smile, a positive and a desire to do something. It always plays in me. If I was offered something, I always try to try. Let that something will not work. Let the track with Dayneko did not crowned with great success, but I realized that it wasn’t for me. Over the years, I hear from people is the same: ‘Why do you need it, when you will calm down?’ Do not listen to them! I’m very glad that I have an internal charge: to do lectures, master classes for children and adults. Athlete in politics it’s generally an incomprehensible to me phenomenon. We need professionals to rule the country. For athletes it’s better to develop in their direction, become a coach, to study to be a psychologist, go to sports journalism. You should always try and look where it will turn out – there try to break through. Some would say that’s easy for me to talk, when I have an Olympic medal, but believe me, now it has no meaning for me. My family, my daughters are much more valuable for me than victory. I had an offer to head all the figure skating before the Olympic Games in Sochi. I had to be responsible for the construction of an ice palace, responsible even for number of toilets in the locker room. But I refused. I have studied the experience of the Olympic Games in Vancouver and decided not to take this responsibility, because I knew that I won’t be able to combine work on the Olympic Committee and my desire to continue my career in “Ice Age”. While sport brings me pleasure. Maybe someday I’ll become a sports officials, but only when the iron rust cover my joint.